-Rustic elegance punctuated by romantic Willow and Hewn Pine furniture accents; Hardwood Floors throughout. -Custom galley kitchen with stainless steel appliances (range/oven, dishwasher, full size refrigerator and freezer, microwave oven, double basin sink, coffee maker, dish and glass ware, cook ware. -Living room and kitchen are open to one another. -Custom cast iron wood burning stove for winter months and air conditioning for summertime. -Sunroom to enjoy views of the Shenandoah River and mountains from. -Full bathroom with Whirlpool bath. -Elevated Jacuzzi tub for two in the second story loft. -Vaulted wooden beam ceilings offer airiness and ambiance. 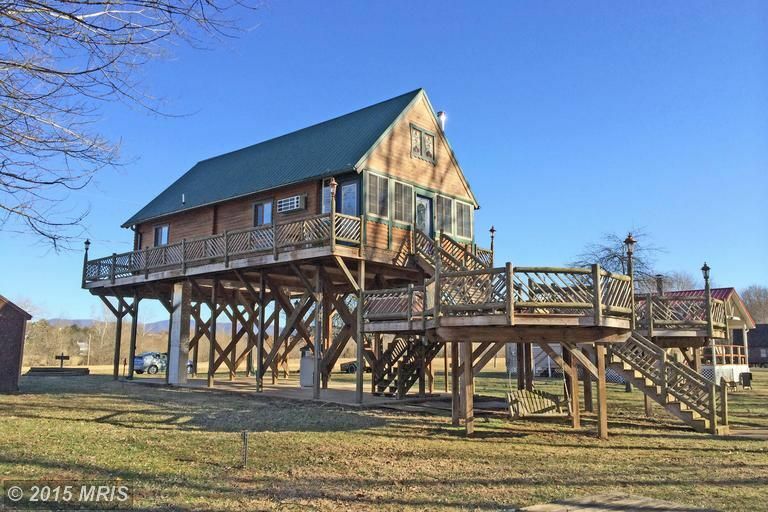 -Cabin sits approximately 60 feet from the bank of the Shenandoah River. The cabin is in a beautiful, remote area in the Shenandoah Valley. Due to the remote location, we do not have internet access, but we do have DirecTV. Also, the cabin is located on a private, dirt road which can get rough. Having a vehicle with four-wheel drive can be helpful, though not always necessary. In the event of a major snowstorm or significant flooding, the road can become impassable, in which case we will gladly change your reservation to a different date without charging any extra fee. The cabin is as described in the posting, right by the river and has a lot if great deck space and wood seats right by the river. It has two bedrooms and a loft with a bed for 1. A lot of the amenities were provided (fireplace, toaster, coffee machine, sheets, blankets, space heaters in addition to heating unit). The cabin is located in a quiet area next to several other cabins and was a great place for a relaxing weekend and star gazing. The basic cleaning was all done (bathroom, kitchen, sheets, main floors) but some parts of the cabin could be cleaned more thoroughly or more often for less dust in the whole place which is felt more with the ceiling fans. Also, we tried to use the hot tub but after filling it and before getting in we turned it on and so many black particles came out. We assumed it hasn't been used in a while and were not committed to draining/refilling. If you plan on using it, I suggest you tell management so they can make sure it's fine before your rental. Both these things are not deal breakers, the location and outside space of the cabin are perfect for a getaway and probably even better in warmer weather. It was a very pleasant stay in a lovely cabin with lovely views. This cabin was totally a absolutely beautiful place to spend time at relaxing. If you love fishing and sitting by a camp fire with all the luxuries of a hotel this is your place. Overall this is a very charming cabin with a truly beautiful decor. The kitchen is well equipped with everything to create a fabulous dinner. Also the cabin is clean, well stocked with linens and other amenities. Nice house in desperate need of some TLC. After reading other reviews I'm not sure we stayed in the same place. The house had ample room with big decks and lots of steps which are obvious in the picture. The deck had some broken slats but nothing that was dangerous. We enjoyed the firepit and river access was simple. The beds were comfortable and the bath adequate with plenty of towels. The bathroom was also clean. The kitchen was not. It seemed whoever cleaned took care of the bath and left. The fridge had not been wiped out, the stovetop was visibly greasy, crumbs on the counter and a sizable red jelly pool running off the counter and down the cabinet underneath. Cleaned this up ourselves, Planning to bake potatoes I turned on the oven and left the kitchen. Noticing a burning smell I returned to see smoke coming out of the burners on the stove. Turned off the oven, opened it's door and decided against using the oven during our stay. Had there been batteries in the kitchen smoke detector I am assuming it would have gone off. There was a wine glass rack hanging in the kitchen covered in dust and spider webs, dust in the eaves of the ceiling, understandable given the height but the wine rack was within cleaning reach. I have stayed in many VRBO/Home Away properties and this house was the most poorly kept up.The TV received one channel, we have Direct TV in our own rental property in the Outer Banks and we are familiar with how to operate it. It just didn't work. We called and left a message about the non-functional tv and the curious lack of a toaster, the owner did call back, 48 hours later, we were on our way home. Not going back. Martina, thank you for your feedback. I am so sorry for the problems you experienced. I wish I could have addressed your concerns during your stay as they would have been easy to remedy. Unfortunately, I didn't receive your single message until a day later. Since you didn't call me back, I didn't realize there was a problem until now because your message said that "everything was fine, but we just have a question." Rest assured, we have spoken with our cleaning crew about attention to detail, the TV is in working order, we replaced the smoke detector batteries, and we purchased a new toaster. I hope you will come again sometime so that you can have the five-star stay our other guests have experienced. My family and I spent two nights at this lovely cabin. If you are looking for an escape from a hectic life, this is your place. Although there are neighbors on both sides, the feeling is of complete serenity and solitude. The beautiful flowing Shenandoah River right outside your door, a cozy fire pit, and picnic table on the porch make for an experience you can't get in the big city!! !